Summer in Gozo is synonymous with the sea, sun-kissed skin and warm smiles. When the summer heat hits, the only solace is throwing yourself into the clean, cool waters that surround the island. Nothing beats that amazing feeling when you dip your toes into the cool, preferably shaded sea. Luckily, the Gozitan coast is dotted with large and small inlets of sea that are perfect for a quick jump into the sea or long lazy days at the beach. What’s the difference between beaches in Malta and those in Gozo? As goes for the rest of the island in general, Gozitan beaches tend to be more natural and less commercialised. Beaches in Gozo are often less crowded and more relaxing. 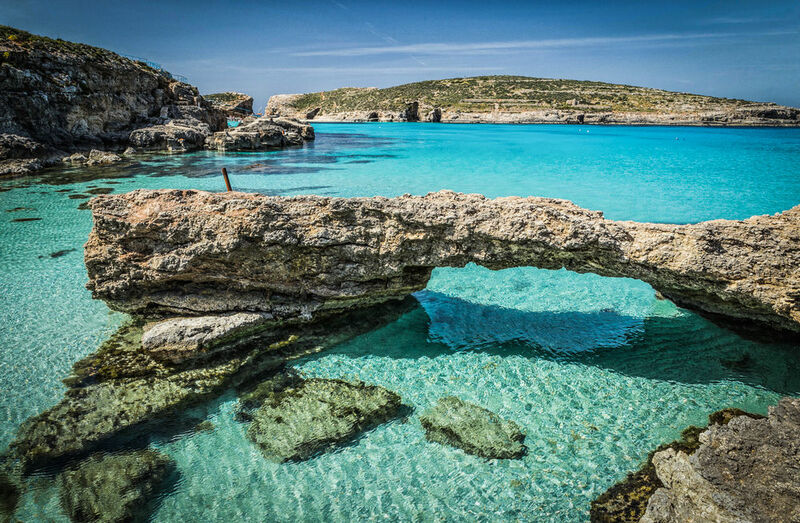 It would be misleading to say that all beaches in Gozo can offer a complete relaxing and quite day at the beach – especially during the high season and the weekends – but you can find a variety of beaches depending on what atmosphere you’re looking for. Whether you prefer to go on a coastal hike, tan on the sand, jump off rocks or dive in the deep blue waters, there’s a beach for you. Possibly the most famous beach in Gozo, Ramla Bay has a wide stretch of red sand with rocky cliffs enclosing the beach. During the summer months, it’s the perfect place for a beach day, albeit a bit overcrowded. You could tan on the sand, read a book under a parasol and enjoy lunch at one of the two restaurants, go snorkelling, diving or any other water sport(jet-skiing, canoeing, paddle boat rentals, etc). On each side of the cliffs you can see a cave, the infamous Calypso Cave on one, and Mixta Cave on the other, each offering spectacular views of the horizon. In the winter and spring time the cliffs are transformed into a green tapestry, making it the perfect place for a hike. On windy days there are a few surfers. This best time to visit this beach would be May-June, or September – October due to the crowds. San Blas is a smaller, more natural version of Ramla Bay. There are no restaurants so take a packed lunch if you plan on spending the day there. It’s also less crowded and quieter – the reason being the step road leading to it. Cars can’t drive down to the beach, and walking down and up in above 30°C isn’t everybody’s cup of tea. The good news is the surrounding area is one of the greenest parts of the island, so if you like nature walks, you won’t mind the effort required. This secluded cove can be found at a bottom of a valley. It’s got a pebbly bay and a rocky bay, with plenty of points on a cliff where you could dive into the sea from. Beneath the clear seas you can find a huge array of marine life – bring a pair of googles and a snorkel. There’s a simple restaurant at this bay that specialises in fish, and surprisingly outdoes most of the fancy restaurants on the island. Once a quiet fishing village, today the area is a popular tourist resort that still managed to hold on to its rustic charm. There’s a selection of water sports to do, impressive restaurants and ice-cream parlours. The bay itself is enclosed with dramatic white cliffs. This little paradise is squeezed between two white rock cliffs at the end of a valley. Swimming in the calm waters of Wied il-Ghasri is an incredibly tranquil experience, with birds chirping in the background. Its underwater caves also make it a famous spot for divers. BELS Gozo English Language School is situated in the lovely village of Kercem. At BELS we take care of everything, from airport transfers to accommodation and leisure activities – so you can just sit back and enjoy learning English abroad.